Beth Allison Barr received her B.A. from Baylor University and her M.A. and Ph.D. in Medieval History from the University of North Carolina at Chapel Hill. Her research focuses on women and religion in medieval and early modern England, especially in how they are viewed and portrayed in sermon literature. How the advent of Protestantism affected women’s roles in the church has carried her research beyond medieval Catholicism into the world of early modern Baptists. Beth is the author of The Pastoral Care of Women in Late Medieval England, co-editor of The Acts of the Apostles: Four Centuries of Baptist Interpretation, and author of more than a dozen articles (published and forthcoming). She is currently working on her next book, Women in English Sermons, 1350-1700. She is also a regular contributor to The Anxious Bench, a religious history blog on Patheos which has paved the way for her contributions in Christianity Today and The Washington Post. She has been actively sought as an academic speaker, including delivering the 2019 E. Glenn Hinson Lectures at the Baptist Seminary of Kentucky, the keynote address for the 2019 Canadian Society of Church History, and preaching occasionally. Beth has been very active in service to her discipline—including serving as president of two historical societies (the Texas Medieval Association and the Conference on Faith and History) and serving on the diversity committee and program committee for the American Society of Church History and the sexual harassment ad hoc committee for The Sixteenth Century Society in 2018. 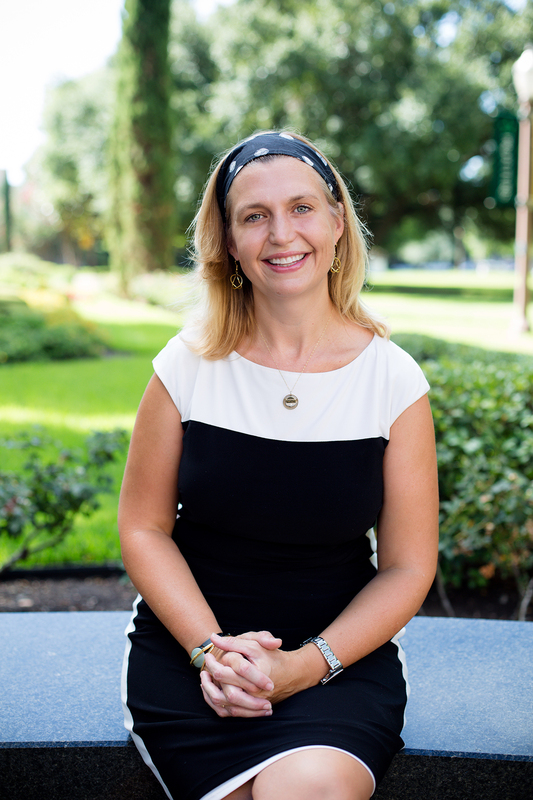 Since receiving tenure in the History Department in 2014, Beth has served as Graduate Program Director in History (since 2016), received a Centennial Professor Award (2018), and received appointment (2018) as a Faculty-in-Residence for the LEAD Living & Learning Community in Allen/Dawson Residential Hall. She is also a Baptist pastor’s wife and the mother of two great kids. Dr. Barr's research focuses on women and gender identity in medieval and early modern English sermons, drawing evidence especially from comparative analyses of biblical women, narrative women, gendered language, and the gendered nature of biblical text included within sermons. She is interested in how the advent of Protestantism affected women in Christianity as well as how and why medieval attitudes towards women in sermons both changed and stayed the same across the Reformation era. “Late Medieval Piety: St. Anne, Martin Luther, and the Salvific Journey.” Luther in Context, ed. David M. Whitford. Cambridge: Cambridge University Press, (July 2018). “What did the Reformation Mean for Women?” Fides et Historia 48:2 (November 2016). “‘she hungered right so after God’s word’: Female Piety and the Legacy of the Pastoral Program in the Late Medieval English Sermons of Bodleian Library MS Greaves 54.” The Journal of Religious History 39:1 (March 2015), 31-50. “Women in Early Baptist Sermons: A Late Medieval Perspective.” Perspectives in Religious Studies, Vol. 41 (Spring 2014) pp. 13-29. “A ‘sterre of e see to ȝyue lyȝt to men’ and ‘myrroure to alle sinful’: A Comparative Analysis of Biblical Women in the English Wycliffite Sermons with John Mirk's Festial.” Fourteenth Century England, Vol. VIII, ed. J.S. Hamilton (Woodbridge, Suffolk: Boydell Press, 2014), 147-164. “The Word that Endureth Forever: A Century of Scholarship on the King James Version.” In The King James Bible and the World It Made, ed. David Lyle Jeffrey (Waco: Baylor University Press, 2011), 149-175. “Three's a Crowd: Women, Men, and Priests in the Late Medieval Confessional.” In A Companion to Pastoral Care in the Late Middle Ages, ed. R.J. Stansbury (Boston: Brill, 2010), pp. 213-234. “Gendering Pastoral Care: John Mirk and his Instructions for Parish Priests.” In Fourteenth-Century England, Vol. IV, ed. J.S. Hamilton (Woodbridge, Suffolk: Boydell Press, 2006), pp. 93-108. In Progress: Women in English Sermons, 1350-1700. The Acts of the Apostles: Four Centuries of Baptist Interpretation, eds. Beth Allison Barr, Mikeal C. Parsons, Bill J. Leonard, and C. Douglas Weaver (Waco: Baylor University Press, 2009). The Pastoral Care of Women in Late Medieval England, Beth Allison Barr (Woodbridge, Suffolk: Boydell Press, 2008). Sabbatical Grant for Researchers, the Lousivlle Institute, a Lilly Endowment Program. Weak and Silent Vessels: The Impact of the English Bible on Christian Women. 2013-2014. Faculty MA Thesis director for Meghan Clark (2013): Hysteria, Witchcraft, and Women's Bodies: A Re-Examination of Robert Jorden's A Briefe Discourse of a Disease Called the Suffocation of the Mother. Faculty MA Thesis director for Laura Oliver (2012): She should have more if she were ruled and guided by them. Elizabeth Woodville and Margery Kempe: Female Agency in Late Medieval England. Faculty MA Thesis director for Sarah Gross (2012): Sed rudibus et indoctis : Women, Orthodoxy, and the Roseberry Rolle Manuscript. Currently Honors Thesis advisor for Katie Novack, to defend 2015 Honors Thesis Director for Laura Oliver (2010): Eleanor Aquitaine and Anne Boleyn: Female Political Power in England.